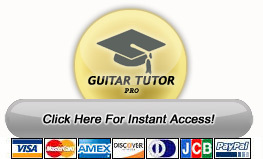 Guitar Tutor Pro : Learn Guitar, Guitar Lessons, Free Guitar Lessons. I am a professional guitarist as well as a guitar teacher. I am also the guitarist and vocalist for the rock band Galatech and am currently completing work on the band's debut album, which will be released in the very near future. I decided to create the 'Mastering Guitar' course because I was far from impressed with other guitar courses on the market, many of which were full of theoretical errors. hear a sample of my playing! Do you want to play guitar in a band? Maybe you just want to entertain family and friends. Whatever your goals, I am going to teach you how to, not only play guitar, but to play it with such passion and purpose that people will never see you the same way again. You will be the envy of everyone that ever hears you play! For 14 years of my life I have dedicated all my time and energy to becoming the best guitarist possible. Through these years I have also discovered the many fundamental errors most guitar students make which totally kills their progress and any hope of improving. Over the past 5 years I have devised a method of guitar teaching which eliminates all the barriers of learning and allows the student to excel at an extremely rapid rate, seeing major results in a matter of hours. All of these methods are thoroughly discussed in my new guitar course called Mastering Guitar which was created with a single objective in mind... To make it the most complete and easiest to follow guitar training kit ever! And I don't mind telling you that I have succeeded without a doubt! While creating the 'Mastering Guitar' course I decided to check out the competition (other online guitar courses) to see what they were up to... and I have to tell you, "I was NOT impressed!" The information they presented was very sketchy to say the least. Of course a beginner guitarist would not know this... This would only become apparent years later after realizing they wasted so much time and effort on a course which was nothing more than a brief overview and didn't really discussed how to utilize the information being taught. So my question for you is this, "Do you want to play guitar like every other wannabe out there, or do you want to gain access to techniques and theoretical approaches that only a seasoned professional can teach?" I think we both know the answer to that one! Most of the techniques I teach were developed over many years of dedicated guitar playing... You will not find them in any other book, that's for sure. What a perfect opportunity to cut years off your guitar training! Discover how to read music notation and tablature with the help of 'The Guitarist's Guide To Reading Music Notation'. Discover a variety of scales including, Major, Minor, and Pentatonic. You will have true freedom to play all over the fretboard! Learn all about the building blocks of chords called 'Intervals'. After doing so you will have the knowledge to create every chord imaginable! Discover all the fundamentals of 'Harmonics', and some very unique techniques that will give your guitar playing a very original sound! Learn a variety of 'open tunings', along with some amazing exercises that will take your guitar playing through the roof. This is just the beginning, I could go on and on. I can guarantee that other online courses don't offer even half of what is discussed! In the 'Mastering Guitar' course you will learn a new approach to guitar that will revolutionize the way you play for the rest of your life. This material is truly one of a kind. No longer will you be bogged down learning the same things over and over again... You will discover techniques that allow your hands and fingers to finally be free to play any song you desire with absolute ease! You may even decide to start writing your own songs! Since the launch of the course I have received a ton of feedback from customers who were overjoyed with the amount of information they discovered while working through the books. Below are a few examples. "Hi Ryan, I just finished the first book of the course. I can't get over how much you've crammed into just one book... And I still have two books to go!" "After looking over your site my son Michael pleaded with me to buy the mastering guitar books. For the last few weeks he has been spending hours each and every day practicing. He has definately improved since he started the course. He told me he can't wait for the next course on lead guitar... Maybe for Christmas!" "... I remember when I first visited your website, I thought you were only lying about having more to offer than other courses. Now I know you were telling the truth and then some. I know this because I actually bought another course and was very disappointed with it. Boy am I glad I took a chance and bought yours, you are miles ahead." "Hey Ryan, I just want to applaud you on creating such an amazing guitar package. It must of taken quite some time, that's for sure. Anyway keep up the good work." "I thought I was a decent guitarist before I took the course with you, how wrong I was. I have learned so much from the books it's unbelievable. I really loved all the detail you went to to explain things so everything made sense. I look forward to your next course!" I remember when I first started playing guitar as a child, I took guitar lessons for about 2 years before heading out on my own. Looking back on those early days I realize that in all that time I learned very little. My teacher would always discuss the same concepts, and at a very slow pace. Of course I now know why... Most guitar teachers plan their lessons to last as long as possible, after all that is how they earn a living! Without guitar students they would have no income. If I only knew then what I know now. Luckily for you I am going to teach you years worth of information in a single course. The cost of which would be close to $3000 if you were to learn guitar from a teacher face to face, not to mention the cost of travel. To sweeten the deal even further I am going to throw in 5 bonuses... totally free! What more could you ask for. Free Bonus #1 – "Guitar Chords Pro 1.0"
When it comes to chords on the guitar, many guitarists get stuck playing standard Major and Minor chords, but with Guitar Chords Pro you will be playing chord shapes you never thought possible. Using a stylish interface, the user can browse through a large database and select any chord they desire. Accompanying each chord is a soundclip, so you can hear what the chord sounds like without even picking up a guitar! But best of all Guitar Chords Pro gives you the tools you need to create your very own chord shapes!! Major, Minor, Suspended, Augmented, Dominant, Minor (Major 7), Diminished! Over 300 Chord Shapes included, all with audio!! Valued at $29.95! Yours totally free! Free Bonus #2 – "eTuner Pro 1.0"
Learning to tune a guitar by ear is without a doubt the core essential for all guitarists. With the aid of eTuner Pro you will be able to tune your guitar in minutes! eTuner Pro gives you the ability to tune your guitar, not only in standard tuning, but also in a number of alternative ways. Standard, Drop D, Standard Eb, D Suspended, D Major, G Minor and G Major. Tuning your guitar has never been easier thanks to eTuner Pro. Valued at $19.95! Yours totally free! Free Bonus #3 – "ClickTrack Pro 1.0"
Keeping in time is another essential component needed by all professional guitarists. The last thing you want is to have poor timing, especially if you intend to jam in a band situation. So do yourself (and your bandmates) a favour and develop precision timing, with the help of ClickTrack Pro! Free Bonus #4 – "The Guitarists' Guide To Reading Music Notation"
The grand staff, treble clef, bass clef, bars, tempo, time signatures, key signatures, accents, rests, repeats, notes, note values, legato, staccato... and tons more! Now you too will be able to read music notation with ease! Valued at $14.95! Yours totally free! Free Bonus #5 – "The Guitarists' Guide To Tuning & Stringing"
Tuning to open strings, tuning with harmonics, how to stretch out the string to speed up settling-in time, winding strings correctly... and lots more! The guide also includes audio examples to aid in your learning. Now your guitar will sound like it should! When people decide to take up playing guitar for the first time they usually get very excited, go out and buy a guitar, TRY to play it for a few days, then finally stuff it in the closet to gather dust. Sound like anyone you know? The sole reason this occurs time and time again is simple... Biologically, human beings are programmed to create and expand. But of course you can't create and expand if you don't know how to use the device that makes this possible (in this case a guitar). Once you begin to see results day after day you begin to become addicted to this feeling. This is what drives successful people in every industry in the world... This addiction, this feeling! I designed the layout of the 'Mastering Guitar' course to allow you to create this feeling inside. After the first few weeks you will be addicted to this instrument, and will never want to put it down again! "How is this possible?" you ask. Because you will be improving and growing on a daily basis. You will finally realize that you can become a truly amazing guitarist, you can write your own songs... You can play other people's songs... You can do it all! This is the power of self improvement! Once you understand that you are biologically no different than any other successful person, you will have no doubt in your mind that you can succeed at anything! So let's get started! I want you to be at complete ease when making this life changing decision, because I know that if you follow through the 'Mastering Guitar' course you will shed years off the time it would normally take. With that in mind I have decided to offer you an unbelievable 3 MONTH 100% MONEY BACK GUARANTEE! So if you believe that you did not advance your guitar playing skills exponentially by following the course, then all you have to do is email me for a full refund! I will promptly return your money no questions asked! I will go one step further and also allow you to keep each of the 5 bonuses (valued at $99.75) free of charge, as a thankyou for at least trying out the course. Many people have asked why I offer such an amazing guarantee, and my answer is simple... I know, without question, that the information you will learn is going to totally transform the way you approach the guitar that I have no concerns whatsoever about people asking for a refund. In all honesty I have yet to receive even one single refund request! Now imagine yourself a few months from now, did you take advantage of this amazing guitar learning opportunity, and in turn become a fluent and confident guitarist? Or did you pass it up and continue to tread water at your current skill level? For your sake I hope it was the former, after all you have NO RISK WHATSOEVER! So what's the price of the most complete guitar training course available? well, because I want you to learn guitar without having to pawn everything you own, I have decided to offer $3000 worth of information for a limited time for just $97 (normally $167)! "The chords software is great, I am learning so many new chords that I never even knew existed, plus you also made me understand how I can make my own! I just wish I found your website sooner, oh well. Thanks so much!" "Hello, A friend of mine told me about your guitar site so I went to check it out. I was totally blown away with all the stuff you offered (lots of bonuses). Anyway, once I ordered the course and downloaded it I started straight away. At the moment I'm about half way through the second book, I have gained so much info so far, you totally delievered!" "Thanks so much for your email, I wasn't sure you would actually answer. I have been burnt by other websites before who said they offer email support, but you did!" "... I think the whole package is awesome, you're a very talented dude! I also love the fact that all the exercises in the course sound so good, they could belong in a song. Peace!" "Ryan I just completed your course... It took a while. My Dad said he can't believe you charge so little, he told me he would pay 3 times as much! Maybe you should up the price ;)"
You have arrived just in time to take advantage of a special offer which is only available for a limited time! I have decided to reduce the price of the 'Mastering Guitar' course even further from the already low price ($97), to an amazingly low $47.00! However, please be warned that this special price can not last, so I suggest you act now, or regret lost opportunities. Once this special offer expires the price will return to $97. Our system will allow you to access the Guitar Tutor Pro members' area instantly, so you can start taking advantage of these incredible guitar skills within five minutes! Even if you are an internet newbie and have never downloaded anything before, rest assured... The entire package comes with complete instructions, it's so simple! • Zero shipping and handling costs. • No need to sit and wait weeks for the package to arrive. • You receive the Mastering Guitar Course at a lower price because it costs me less to create a digital product. The best way to place your order is by using Clickbank's Secure Server. Clickbank is known internationally as a leading online retailer which specializes in digital products and software sales. So you can be sure that all your details will be completely secure. Remember that once you place your order you will be given instant access to the Guitar Tutor Pro Members' Area where you can start downloading the course immediately! Special Purchase Price ONLY $47.00! I am extremely excited about hearing how the 'Mastering Guitar' course has impacted your guitar playing skill, and if you have any questions while going through the course all you have to do is email me! P.S. A common question I'm asked is "do the books and software work on both PC and MAC?" The answer is YES! All the contents of the course have been compiled to work on both operating systems. The members' area allows you to download either the PC version or the MAC version. P.P.S. When you order the 'Mastering Guitar' course you are guaranteed free unlimited updates. So if I decide to add new lessons and new software you will be able to download them free of charge.